"Mohabbatein" is a 2000 hindi film which has Amitabh Bachchan, Shahrukh Khan, Aishwarya Rai, Uday Chopra, Jugal Hansraj, Jimmy Sheirgill, Shamita Shetty, Kim Sharma, Preeti Jhangiani, Amrish Puri, Shifaali Shah, Anupam Kher, Archana Puran Singh, Helen, Saurabh Shukla, Parzun Dastur and Raman Lamba in lead roles. 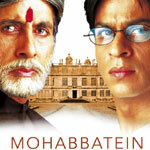 We have 4 songs lyrics and 3 video songs of Mohabbatein. Jatin and Lalit have composed its music. Udit Narayan, Jaspindar Narula, Sonali, Manohar, Priya, Udbhav, Ishaan, Shweta, Lata Mangeshkar, Manohar Shetty, Shweta Pandit, Sonali Bhatwadekar and Pritha Mazumdar have sung these songs while Anand Bakshi has penned its lyrics.